SIHANOUKVILLE, Cambodia - Rescue and salvage ship USNS Safeguard (T-ARS 50) arrived in Cambodia Oct. 22 as part of the annual exercise series Cooperation Afloat Readiness and Training (CARAT). CARAT Cambodia is part of a bilateral exercise series between U.S. Navy and its naval counterparts from Bangladesh, Brunei, Indonesia, Malaysia, the Philippines, Singapore, Thailand and Timor-Leste. Each phase of the exercise is tailored to support mutual host-nation and U.S. objectives. This year's CARAT Cambodia focuses on diving training. 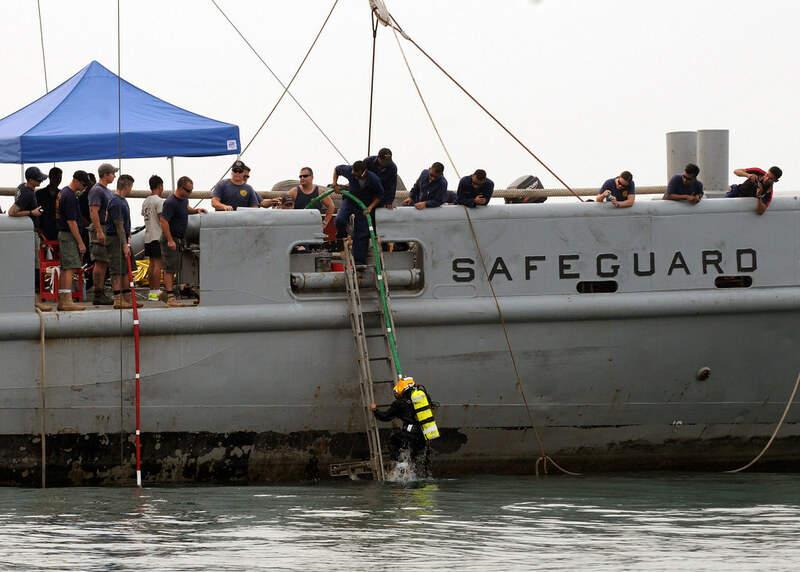 "The Safeguard team looks forward to participating in extensive diving training during this year's CARAT exercise, an event designed to build interoperability and strengthen relationships between our two navies," said Capt. Ed Santillan, civil service master aboard Safeguard. Embarked U.S. Navy divers from Pearl Harbor, Hawaii-based Mobile Diving and Salvage Unit One, Company 1-3, will train with Cambodian navy divers to share best practices and techniques in dive and salvage operations. The exercise will include both classroom training and at-sea diving exercises. Classroom training will take place on board Safeguard where MDSU divers will provide an overview of dive medicine and maintenance of dive equipment. Divers will demonstrate the use of Safeguard's hyperbaric chamber to treat decompression sickness required after deep-water dives. Divers will also conduct training on the use of Safeguard's remotely-operated vehicle (ROV). "Our dive team hopes to build a lasting working relationship between U.S. Navy and Royal Cambodian navy divers," said MDSU 1's officer in charge Chief Warrant Officer Three Michael Miller. "This is a great opportunity to build upon past successes from previous CARAT exercises." Safeguard's civil service mariners navigate the ship, and provide engineering and supply services to support the divers throughout the exercise. Mariners also operate on board cranes and rigid-hull, inflatable boats for dive missions, and ensure generators are running to supply power for the recompression chamber, shipboard lighting, and compressors. Safeguard's steward department prepares meals for the crew and additional crewmembers embarked aboard for the exercise. MSC operates approximately 110 noncombatant, U.S. merchant mariner-crewed ships that replenish U.S. Navy ships, conduct specialized missions, strategically preposition combat cargo at sea around the world, and move military cargo and supplies used by deployed U.S. forces and coalition partners.